I actually agree with some of the people on 4chan Sombra wasn't really a real character, he was just a plot device, an obstacle for Twilight and the rest to overcome; but for being that I though he was pretty cool. 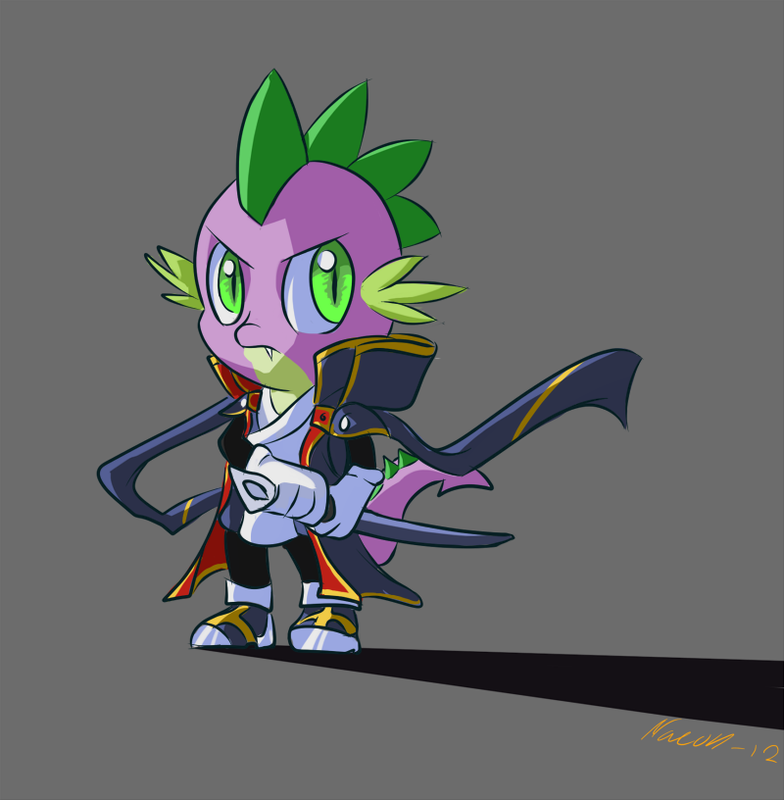 I thought that whole little bit with Twilight and Spike was very sweet. Rarity was very funny in the beginning as well with the over reactions to the crystal ponies and stuff. I also loved Shining Armors Wife tossing at the end that was cool. Also what about that black book that Luna had at the end of part 2? I think we are clearly seeing the beginnings of an over arcing plot again! YAY! Over all the episode was great I think some parts of it were rushed but I don't think it was to the level that Royal Wedding was. I can't wait for what the res to the season has for us! Also I can't believe I forgot this that Fluttershy body suit Pinkie Pie had! I freaking lost it at that part I was laughing for a long while after that. I believe a villain like this is what is known as a "generic doomsday villain", named after the monster that killed Superman in the early 90s. YES! The book! I must know what was up with that book! SECOND YES! Fluttershy suit! There are going to be SO MANY COMICS off that! He also sounded like a Darth Vader Sean Connery, but that's neither here nor there. Also, for fun, I'mma gonna sum up Sombra's whole deal, so spoilers. First, he conquered the empire. Then, he hid the one thing that could defeat him in his own castle, where everyone would be too scared to look. He hid the entrance to the hiding place in his own throne room so that anyone looking would have to go through him, then made the only way to the Heart only accessible with the same kind of magic he could use, which is doubly clever considering there were no unicorn crystal ponies, so no magic to begin with. His fear spell trap would then probably make the victim see Sombra himself, since everyone was so terrified of him. 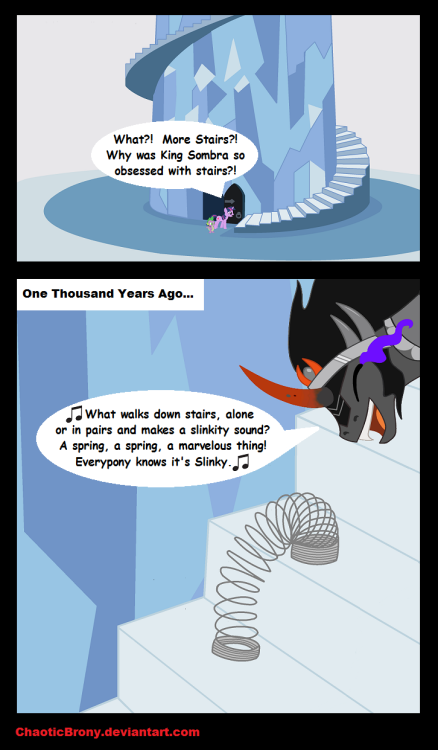 He put the Heart at the top of a massive spiraling staircase, which again is doubly clever since there are no pegasi or unicorns among the native crystal ponies. And finally, he set a crystal trap around the Heart that can't be teleported or flown out of and is proximity-activated. This guy was too awesome a villain for this show. Not having the immense power of an alicorn or chaos god at his disposal, or a massive army like the changelings, Sombra had to rely on his own intelligence. And did AWESOMELY. Is it obvious I'm a fan? And finally, he set a crystal trap around the Heart that can't be teleported or flown out of and is proximity-activated. pretty sure that wasn't actually a trap he had set before. If you watch, you can see him noticing that Twilight set off the proximity activated alarm, then manually cast the crystal spell. So likely, when he was actually in power, that would have been the point where he had to step in and handle things himself instead of leaving it to previously set traps. I guess an alarm system may be considered a type of trap in some sense, but the crystal wasn't part of that trap. I just realized. In thanks for saving them all, the crystal ponies must have given Spike SO MANY GEMS! I bet Crystal Empire gems taste better than any other gems! Edit: also, I'm not sure if anyone's aware of this, but there's an orchestral version of the opening theme song on iTunes. 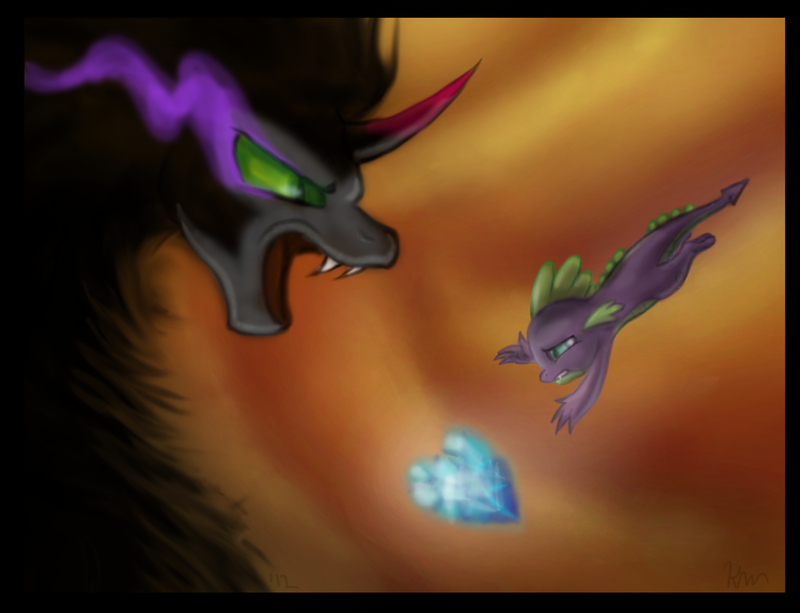 Yeah, there's really no doubt that Sombra was an effective villain. But for me, villains are only really likeable when they have a personality to connect (or contrast) with. And as has been said already, Sombra just doesn't have one. The one thing that could redeem him for me (as a character) would be if he's not actually gone gone, and only his physical form was lost at the end of the second episode. And there actually is some evidence (which is rather flimsy, I'll admit) that does suggest this. Episode 5 has been confirmed as a confrontation between Twilight and Trixie, and we've seen several pictures from that episode. The newer reveal was a background picture of Ponyville, dark, and covered in statues and other such things indicating that Trixie has either legitimately taken over Ponyville, or has cast some very powerful manipulation magic that no one is able to reverse. And in a much earlier reveal, we saw a few pictures of Trixie, with a slightly glazed look in her eyes, wearing a necklace with a striking similarity to Sombra's color scheme. So while it's a bit of a long-shot, we may yet see Sombra getting some development and backstory in this season. I'll hop on the "King Sombra was underwhelming" bandwagon. I really liked the foreshadowing fakeout though! Twilight learned that doing what's right is more important than following instructions. Well, at least we know we'll be getting a whole lot of awesome art out of the guy. And that piece of art right there is AWESOME. I wonder where Pinkie got that Fluttershy costume!? What I wonder more then anything about that is if she has one for each of the mane six. Most likely. Also, did anyone else notice Spike slowly backing away when Pinkie revealed herself? I don't think we should be questioning her that much. Sombra was a fine villian. 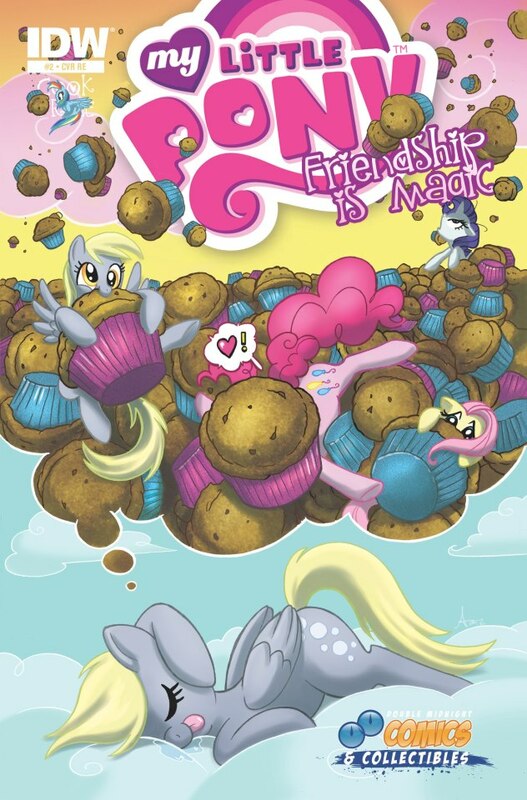 I realize that Hasbro knows about bronies and all. but MLP is still a cartoon targeted at preteen girls, not men in the 14-60 age group. There's only so much they can do to cater to bronies without totally forgetting about the primary target of the toy line/cartoon. People really need to remember that when they are asking for Young Justice like plotlines in FIM. Agreed. Honestly, I'm shocked the show's creators were able to get away with his saying "My glorious little slaves..." to the cowering crystal ponies. Although, it's also good to remember that including darker elements isn't necessarily catering to bronies. After all, the first MLP special way back in the 80s had the villain threatening to behead Spike. I doubt we'll ever get anything like that in MLP: FiM, and getting that won't necessarily improve the show, but still. 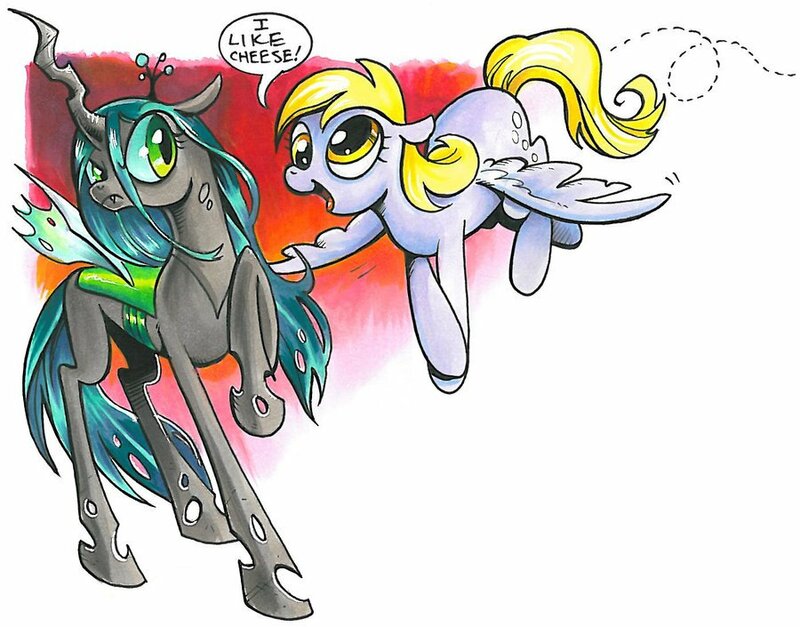 It's a light, fluffy kind of darkness that fits MLP, so I don't think they were catering to bronies at all. So far when they give nods to the older male-gendered fanbase, they are usually short things. I don't think they will every approach the level of giving a whole ep over to catering to bronies, having Derpy speak was likely as far as they will ever go. And given that backfired, I wouldn't expect it again. I would say that smart writing and more well-developed villains are something that the show did well right from the beginning. What we've been talking about doesn't really have anything to do with "catering to bronies" or "not catering to bronies". Kids show or not, FiM has demonstrated time and time again that it is a higher quality show than your average cartoon, and feeling a little underwhelmed when the main baddie for their season opener is... well, underwhelming... is not at all unjustified, in my opinion. Not every issue that's brought up with the show needs to come down to whether the show is catering too much or too little to bronies. I would like make an amendment to what I said earlier. 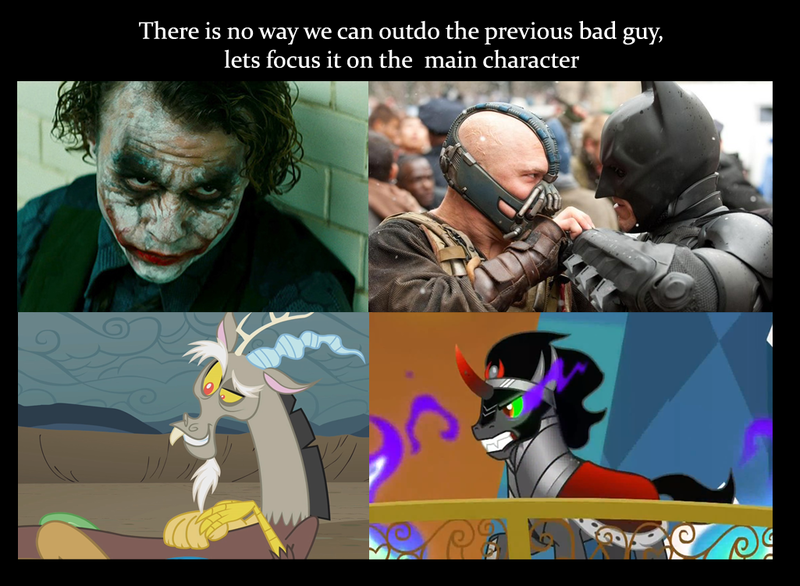 I don't think King Sombra is a bad villain, just not used properly. The story just did not have enough material for him. If they bring him back and give him a second chance I think he would be as big a hit a Discord or Chrysalis. I now think that the reason why we didn't get to see first hand Spike's worst fear was because it would be way too heartbreaking. That has to be one of the most heart-breaking drawings I've ever seen come out of this fandom. Just... dang. On an unrelated note, I'm sure the King Sombra topic is starting to wear thin, but I just want to share this really neat analysis of him with y'all. Very insightful I think, and makes a great comparison between Sombra and Sauron. The problem with Sombra isn't that he's too "soft." It's that he was almost nonexistent. He could have been written out of the episode entirely and replaced with just some sort of magical shadow. Just had a funny thought regarding the season 3 premier. 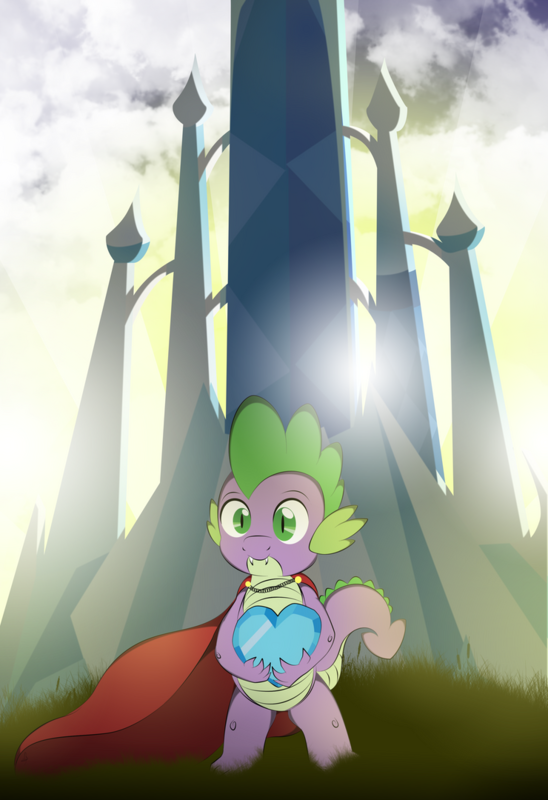 Twilight comforting Spike: "I will never send you away." 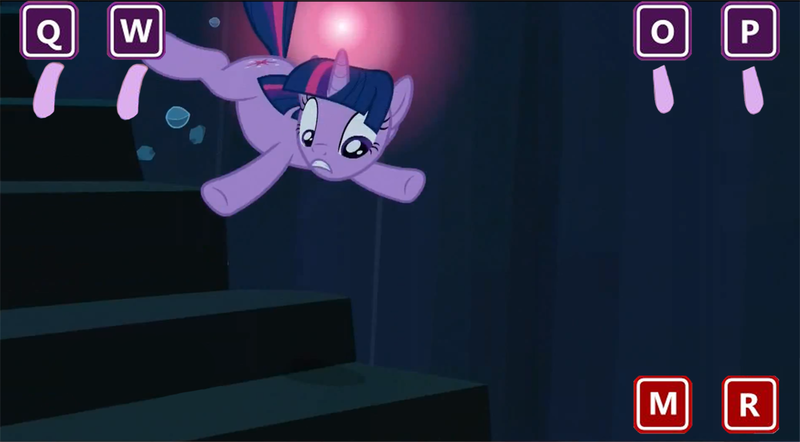 Five minutes later when Twilight's trapped: "Go!" I read that in his voice. It was marvelous. I have completed another worth while image of anime styling. To Derp is to dream! And Derpy can charm anyone! She is so friendly! Some Teaser Images from The Hub website Looks like the CMC and the Pets are gonna be teaming up for something. That should prove to be interesting. "CMC" "and" and the "owl" should used in a sentence only in this way: "the CMC and the pets (which oincludes the **** owl) are going to have a horrible episode". Hey, isn't that the big crystal tower in the background? The one in the Crystal Empire? Also, Tank looks adorable in those goggles. I kind of have a feeling that image may have been put together to mess with our heads. because CMC and pets are kind of an odd combination. escpecially if you add in Crystal Empire. they still could have put it together and included it just to mess with us. It's what, less than a second of the video? I can't imagine that would take up much time or money to do, especially wit flash animation. though if it is real, It's good to see they won't just forget about the Crystal empire after the first episode. and that they haven't forgotten Tank. maybe it takes place parallel to the premier and the CMC and pets missed the Mane 6 so they followed them. and Angel isn't there because he's a bunny and can care for himself if he needs too cause he's a woodland critter. When have they ever done anything like that to mess with us?